United States Naval Aviator and former astronaut Neil Armstrong made history on July 20, 1969 when he became the first man to walk on the moon. His first flight in space which took place in 1966 aboard Gemini 8 was commemorated as the “first manned docking of two spacecraft”. Armstrong is the recipient of the Congressional Space Medal of Honor. Neil Armstrong was born August 5, 1930 in Auglaize County, Ohio to parents Stephen Koenig Armstrong and Viola Louise Engel; he had two siblings. The family moved several times due to Stephen Armstrong’s job, but finally settled in Wapakoneta in 1944. Armstrong attended Blume High School and was an active Boy Scout and eventually earned the rank of Eagle Scout. His love and passion or airplanes led him to a pilot’s license at age fifteen. Armstrong was educated at Purdue University where he studied aerospace engineering in 1947. He was also accepted to the Massachusetts Institute of Technology (MIT), but declined the offer. In 1955 Armstrong graduated with a Bachelor of Science degree in aeronautical engineering; he then went on to attain a Master of Science degree in aerospace engineering from the University of Southern California in 1970. In 1949, during his studies, Armstrong was called to active duty with the Navy. He won his jet wings at the Naval Air Station Pensacola and served in Korea in 1950; Armstrong flew 78 missions over Korea in Navy Panther jets winning a Korean Service Medal and a Gold Star. Armstrong joined NACA, (National Advisory Committee for Aeronautics) as a research pilot at the Lewis Laboratory in Cleveland and later transferred to the NACA High Speed Flight Station at Edwards AFB, California. As a test pilot, he made 7 flights in the X-15 aircraft attaining an altitude of 63,198 meters (207,500 feet). In 1962, Armstrong was transferred to astronaut status. He served as command pilot for the Gemini 8 mission, launched March 16, 1966, and along with David Scott, performed the first successful docking of two vehicles in space by mating his Gemini 8 with an uninhabited Agena rocket. In 1969, he became commander of Apollo 11, the first manned lunar landing mission. Armstrong launched from Kennedy Space Center, Florida on Wednesday, 16 July 1969 and landed on the moon four days later. He was accompanied by Command Module Pilot Michael Collins, and Lunar Module Pilot Edwin E. (Buzz) Aldrin, Jr. Neil Armstrong became the first man walk on the moon and returned to earth July 24, 1969. 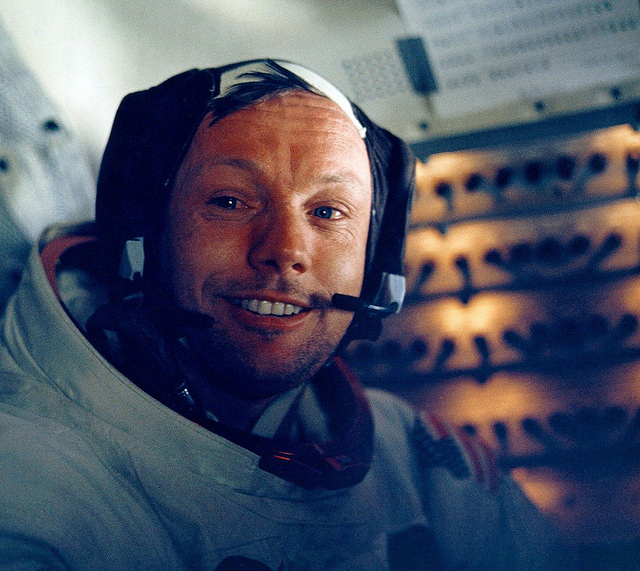 Armstrong was awarded the Presidential Medal of Freedom, and the NASA Distinguished Service Medal, the NASA Exceptional Service Medal, along with seventeen medals from other countries. He received the Robert H. Goddard Memorial Trophy in 1970; the Robert J. Collier Trophy in 1969; and the Congressional Space Medal of Honor, 1978. Between 1970 and 1971 Armstrong held the position of Deputy Association Administrator for Aeronautics, NASA Headquarters Office of Advanced Research and Technology, and from 1971 to 1979 he was a professor of Aerospace Engineering at the University of Cincinnati. He has served as chairman of Computing Technologies for Aviation in Charlottesville, Virginia and chairman of the board of AIL Systems in New York. In 1986, he served as vice chairman of the presidential commission that investigated the Challenger explosion.